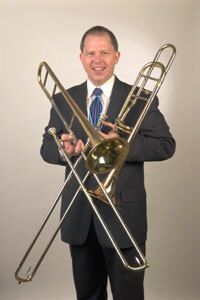 The trombone has 7 positions: First, Second, Third, Fourth, Fifth, Sixth, Seventh or 1, 2, 3, 4, 5, 6, 7. When learning your trombone positions, rather than think of them as 7 separate positions, it is helpful to think of them in groupings. This way you can compare each one to its partner, making it easier to find your positions quickly and more accurately on the slide. 1 is in all the way in and easy to find, so think of 2 as next to 1. 2 is often played longer on the slide than it should be. Keep it closer to 1 to help you find it better. Always listen to make sure they sound the right distance apart. 3 is just before the bell, and 4 is just past the bell. Think of 3 and 4 as on either side of the bell from each other. Keep each one on the correct side of the bell. Always listen to make sure they sound the right distance apart. 5 is very often played too close to 4, so think of it as next to 6. 6 is about arms length out for many players. If you think of 5 as next to 6, it will help keep you from playing 5 too short on the slide. Always listen to make sure they sound the right distance apart. As you listen and learn the trombone slide more from practice, you will begin to be able to tune the positions faster and more accurately. By adjusting from the slide position groupings, you will learn more precisely where each slide position is by its relationship to the other. You will find it easier to locate your positions in groups because each position always has another with it to help you find them, except 7 which is all the way out.